As I wandered through my local natural grocer’s recently, a stack of books on a table caught my eye. Recipes for flavored waters? I glanced at the bottle of (somewhat pricey) flavored water in my shopping cart–a weekly indulgence–and knew that I had to have this book. For years now, water has been my sole beverage. In the winter, I drink hot water. In the summer, I drink cool water. Don’t get me wrong. I like water. I don’t miss soda or milk. I don’t often miss juice. But water has a tendency to get a little bit…..boring. And, with summer upon me, I need some motivation to get hydrated. 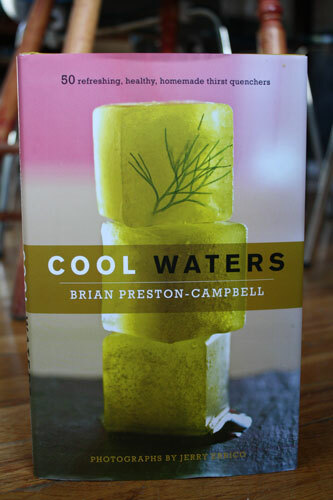 Saving the day and my palate, Cool Waters by Brian Preston-Campbell arrived in my mailbox just in time*. I can’t begin to tell you how much I love this cookbook. Can you even call it a cookbook when nothing is cooked? I guess it’s more of a recipe-book, or a book of really-good-ideas. 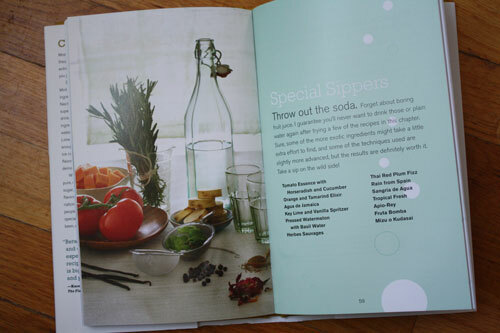 The recipes are divided into three chapters: Quick Quenchers, Nutritious Nectars, and Special Sippers. There is also a chapter with flavored ice cubes (genius! ), but since we don’t own an ice cube tray I haven’t been able to try them out. Most of the recipes have a beautiful color photo to go with them, which will make you wish you had all of these waters on tap to enjoy at a moment’s notice. Not that there is anything difficult about making the waters yourself. Many of them simply involve steeping some amount of herbs, fruit, or vegetables in a quantity of water. Some of the recipes call for a puree, which is then strained and diluted (if you have a high-powered blender you’re probably off the hook for the straining–lucky you!). 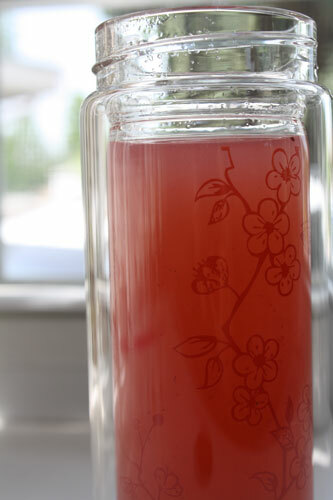 My favorite drink that I tried was the strawberry-lavender water, romantically titled June Fields. 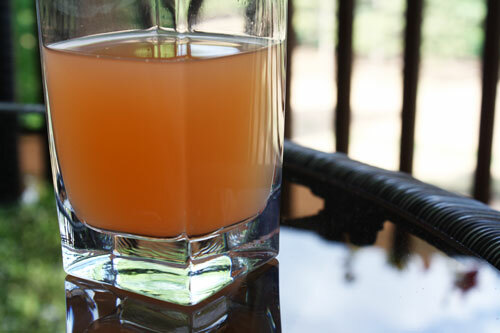 I kept the puree in the fridge, treating it as a concentrate that I diluted one glass at a time. This method has worked well for all of the recipes that call for a puree. And it allows you to keep your seltzer water fresher than if you mixed up a whole pitcher at once. My mother-in-law graciously stirred up several batches of the Eau de Carotte for my birthday celebration. It was delicious and refreshing with chicken curry and Paleo carrot cupcakes. My other favorite recipe uses the steeping technique to infuse the flavors of herbs into a pitcher of water. This was as easy as a trip to the garden to snip some herbs, shoving them into a tea ball strainer, and leaving them in a pitcher of water overnight. 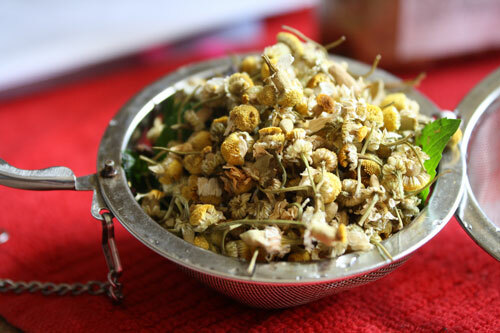 This particular recipe, called Wind Down, uses herbs that are said to induce relaxation and sleep. Personally, I found it to be refreshing at all times of day. If you’re looking to cut back on your consumption of more sugary or caloric beverages, but make icky faces at the idea of water, I think this cookbook belongs on your shelf. If you’re already on the water bandwagon, but your tastebuds are getting a little bored, this cookbook also belongs on your shelf. If you’re a hostess with the mostest and want to be sure that everything, right down to the water, is perfect for your summer entertaining, this cookbook definitely belongs on your shelf. Easy recipes with tasty results? I raise my glass to you. * Review posts are my opinions on items that were sent to me free of charge. The items were given to me, but the thoughts and opinions are my own. I only provide reviews of items that I find to be truly worthy of recommendation. Puree the strawberries in a blender with the still water until smooth, for about 1 minute. During the last 10 seconds, add the lavender. Strain through a fine-mesh sieve into a large pitcher. Add the sparkling water, stir gently, and serve.